A few weeks ago I was over the moon to be asked to join the Frugi Family! Frugi is a brand I know and love already, and to be able to work with them and help to shout about their fantastic clothes is an honour! Athena was able to pick a dress from their new S/S16 range, and with a little nudging from me she went for the Zennor dress in the pretty ‘Anchors Away’ print. 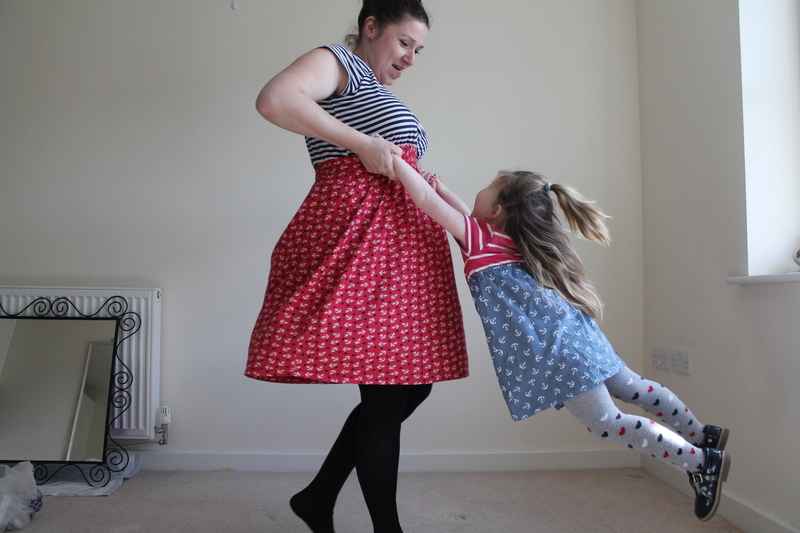 Basically I wanted to be able to wear one of my Frugi dresses and be all matchy matchy with her! Athena’s dress is a gorgeous jersey material striped top and a lined skirt with anchor print on. It will be perfect for summer days when the weather picks up but on the drizzly day when we went back to pick some bits and bobs up from our old flat (perfect for qa little photo shoot as it was empty!) she teamed it with colour coordinating tights and blue T bar shoes (she picked both out herself, I was quite impressed!) and a navy blazer as a jacket! The Zennor dress comes in two other designs, including a gorgeous blue and yellow floral, and is made from Frugi’s lovely soft organic cotton, which keeps it’s freshness and softness wash after wash if my two dresses and Arlo’s little hats are anything to go by that we’ve bought in the past! 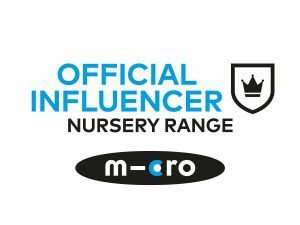 All the styles are designed to be wearable no matter what your child gets up to, with poppers in the right place and lots of room for growing! The reason I wanted Athena to veer towards this Anchors Away print is because it is very similar to my dress, an anchor print skirt and striped bodice, only in opposite colours! Athena had done a lot of spinning and was leaning in for a rest in the photo above, she’s not as grumpy as she looks! She loved us wearing similar clothes for the day and kept pointing out the anchors every so often! In terms of cost per wear this dress is beating everything else I own hands down, I bagged it in the Sale last year and wear it probably two times a week on average! It is perfect for discreet breastfeeding as the top just pulls aside and now that I can ‘twin’ with Athena it’s going to be worn even more! You can see the full range of kids clothes, from birth to ten years, and for pregnant and breastfeeding mamas on the Frugi website, and follow them on twitter and facebook to keep up to date with new released and offers! As part of the Frugi Family we were sent an item of our choice to review for the purpose of this post. Previous Post #WhatMyKidDid – Arlo is ONE! I love Frugi’s range of maternity and nursing wear, I am only sad I don’t need to wear it anymore. Love that you are co-ordinated and her dress is too cute! I used to love Frugi when the kids were little and I had a great b/f dress … never managed to twin with my daughter though. YOu both look fab! Simply lovely the pair of you. We chose the same dress in the yellow sunflowers and I love it! So soft and colourful, great with bare feet or teamed with boot, for parties or the beach. Love the twinning!! That dress is gorgeous, the nautical theme is perfect for summer!! Great choice. I love the fact you are almost matching. How awesome is that!! Such a cute little dress too.